The Indian Railways on Saturday said the Vande Bharat Express possibly hit a cow on its return journey from Varanasi to New Delhi, causing it to break down for a while. Those on the train said it was a traumatic experience. Railway officials said commercial operations of the train would start as scheduled from Sunday. Indian’s first semi-high speed train, Vande Bharat, was flagged off on Friday from the national capital by Prime Minister Narendra Modi. On Saturday, during its return journey, it ran into trouble near Barhan, about 600 km northwest of Varanasi. At 4:30 a.m., it stopped on its tracks. Power connection to several coaches failed. Smoke and a foul smell were detected in at least four coaches, along with a rattling sound, causing panic among passengers. At first the train stopped briefly before resuming its journey. 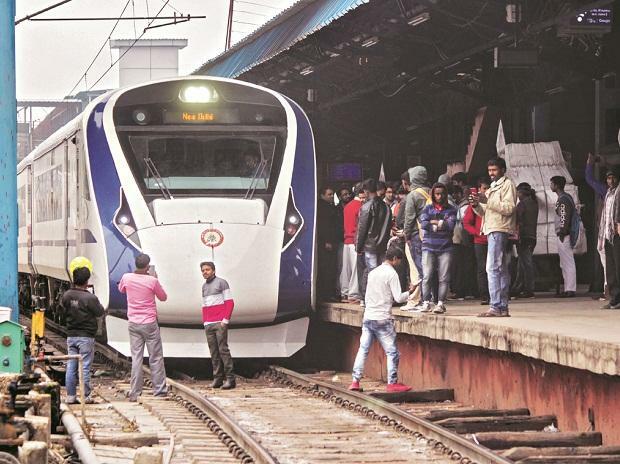 It went on for a few kilometres at 10 kmph, before coming to a complete halt at about 5:30 a.m.
Officials on board said the power failure had caused a technical snag, followed by the parking and holding brakes being jammed. They were heard issuing instructions over the wireless system that the train should not run at more than 40 kmph. “There was a major technical fault leading to the breaks locking and friction. There was also power failure in four coaches,” said an official who did not want to be named. About 7:50 a.m. railway officials stopped another train near Chamraula, about 190 km from Delhi, and asked all media persons, including this reporter, and to evacuate Vande Bharat and get into it. Vande Bharat reached the New Delhi railway station only at 1.15 pm, taking more than 10 hours. Another official said such snags may take 8-10 hours to get repaired. Vande Bharat has 16 coaches and can ferry 1,128 passengers. It was conceived and executed in 18 months. The train is fully booked till February 24. It can run at a speed of 130 kmph, while its average speed is expected to be around 99 kmph.